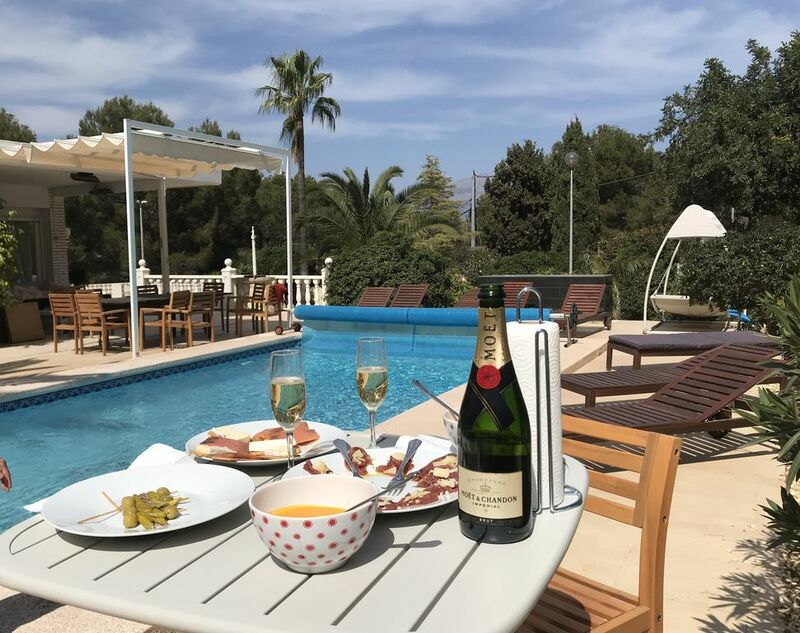 Close to Altea, close to Albir village, close to Benidorm with its nightlife but at enough distance to be at a quiet place, close to the beach & restaurants & shops & supermarkets & spa/wellness center. 8 km from the center of Altea, 1800 meters from Albir village, 6 km from Benidorm with it's 5 water-, animal- & leisure parks, the largest discotheques of the Costa Blanca, and at enough distance to be a private place, close to the beach & restaurants & shops & supermarkets & spa/wellness center. Close to 3 Golf courses and a driving range at 1500 metres distance. A privileged private environment with the neighbours at 20-100m away. At walking distance from the natural park of Sierra Gelada hill, and at 800m away from the touristic medieval events Castle Conde D'Alfaz... far enough to not be disturbed for a quiet night of sleep or privacy. Fit for people who come over to train bike riding due to the unique combination of flat roads and the mountain climbs at short distance. Ample integration of villa, private pool, sun terrace, BBQ area, pergola shade area for dining & chilling at same level. Private tennis court not included for now. Heated pool with Solar Panels and additionally for the winter-months an electric pool heater so that we can get to 28 degrees pool temperature during the winter. Central heating throughout the villa, as well as 6 Aircon units for the Summer. UK Skybox Satellite with all open UK SKY-BOX channels and a Dutch KanaalDigitaal Satellite contract with Astra Channels. The 2.2m high wall ensures privacy in the 2000m2 garden where the kids to play without worries, a private driveway where you can park behind the large gate up to 8 cars, the 300 m2 terrace which is fully integrated with the 160m2 Villa. The villa has 30cm thick outer walls and its insulated flat roof help to enjoy a cool summer and warm winter, and the 6 air-conditioners / inverters will assist with keeping a pleasant temperature all year round. It's a 900.000€ property but not a typical place where the owner rents its own place: the Villa got refurbished and each year further improved to keep a high standard, and I make enhancements where my renters suggest to do so. I invite you to compare pictures with other houses.... to pay special attention to the size of the tables, the size of sofa's, the quality of the beds, the real capacity to enjoy. We receive positive feedback, on the house and on the service, we listen as we want our Renters to return. This Villa was designed with a real preparation and capacity for 12 + 2 = 14 including large sofa's and capability to sit, eat & enjoy together... and more smaller places to break out. We can add up to 4 cots and have bed-bumpers etc for the toddlers. Each of the 4 Bedrooms have their private air conditioning, also in the living room and kitchen. 4 Bedrooms have the ability to either: separate the beds, or to move/tie the beds together as one bed: tell me the lay-out combination you want. We can add a separate bed in the large bedroom and have a cot and crib available as well as high chairs , potty, baby-bath, cups-n-plates, safety swimming vests, cots and bed bumpers for 4 babies/toddlers/infants. The living room has a large sofa-bed with Good Quality sleeping and dark curtains to keep the light out. American pool table and Ping Pong table. The Terrace has under the sunroof a breakfast area for 10 and under the pergola next to the pool another eating area next to the stone BBQ for 20 people. The living room has an inside dining area for 10 but you will use inside areas mostly during the winter time as it's outside mostly sunny and nice. The house is equipped with a 60 inch television, satellite receiver with Dutch Canal-Digital, wifi internet, TV+DVD. Denon Home Cinema. We also installed a British Satellite receiver which has the capability to see all 1000+ open British channels. In the 3 Bathrooms and in 2 bedrooms there is a make-up mirror with a good quality hair dryer so that you don't need to bring your own. Your reservation becomes confirmed upon payment of your refundable non-cancellable Security Deposit, via bank-transfer, 1000 €. Refund will happen after check-out & end-inspection upon settlement of any breakages, excessive cleaning where applicable, and usage of electricity and gas if any. - Set kitchen, bath, bed, terrace linen/towels: 18€ per person, per week. - Electricity: 0,3€/KWh (Cost-price) as we can't estimate how much you use the airconditioners/heaters and we don't want to penalise people using less then average: airco is not really needed as roof is highly insulated and the walls are 30cm thick so well prepared to keep cool during summer & warm during the winter. - gas for central heating: 4 euros per cubic metre, measured via gas-metre-readings. Pre-retired, former manager for IBM at the European HQ in Madrid. We have the villa since 40 years in the family and we rent out when the family is not there. We have made frequent updates of the villa to enhance the vacation experience for all. Please compare the pictures of other villas taking a special look at the number of seats at the sofas at the size and number of the break-out areas. The beds are new, the villa is kept up to standard and its style renewed several times during the year as we live ourselves in the villa when it's not rented out. Overall: we're an experienced team striving for 5 star holiday experience of our Customers. Summer: large 300 m2 terrace fully integrated in a 2000 m2 private garden with a high wall. Many break-out zone's and places to retreat during the holiday, and a large terrace for nice dinner etc around the BBQ. 6 Air Conditioners. Ample space for sun and for shade. 3 Fridges, well equipped for large groups and family: beds can be single or double. Winter: heated pool with solar and electric heating: solar panels alone don't give high temperatures in the winter months. Newly installed central heating in all rooms. Each bathroom has a Hairdryer, each bedroom has a making-up mirror With renting the Villa one includes sets of linen & towels: hand-towel, bath-towel, terrace-towel, kitchen towels. The villa is located at 1900 meters from the Albir beach, 6km from Benidorm, 8 km from Altea 6km from the mega discotheques of the Costa Blanca 6 km from the Aqualandia Water-Leisure park, really nice for old and young, I go each year 6 km from Mundomar the animal park where one can even make a reservation to swim with Delphins 15 km from the other large leisure parks of Benidorm, 15 min drive. 15km from the Golf Court, and 1800 meters from the public Albir driving range Albir distinguishes from other beach towns: has stable residents environment who live in Albir all year round, thus Restaurants and Village is always lifely, while other Villages are very empty....Albir is much more mature and still original, very alike the Culture of 20 years ago. Included: Internet / Wifi / 2 Satellites: Astra and large UK dish with-all-open channels, American Pool/Biljart,, 3 coffee machines: Nespresso, traditional filter coffee, Dolce Gusta. Fabulous villa. Had everything you would want and more. Marco and David very helpful during our stay and will definitely look to booking again. Just far enough away to enjoy the tranquility. Very secure and safe. Highly recommend to groups or families. Out of the 11 of us who stayed there we do not have any negative feedback it was amazing. NOT 5 star luxury as advertised- read before booking! We booked April 2018 for a 7 night stay over the New Year Period. We drove 3 days from the UK with our two small dogs and were looking forward to our winter break..... what a disappointment we were in for on arrival!! The owner was away and we were welcomed by a British couple who were very nice. We were briefly shown around the property and immediately alarm bells started ringing when we were told to leave the garage door open as if the electrics tripped we wouldn’t gain access to reset. When we finally got to look around the property ourselves we were appalled. In the kitchen holes had been knocked through the wall into the garage and had tried to be disguised by placing a cupboard infront. This resulted in draughts and possible vermin being able to access the property. The villa was not clean, bearing in mind we had been charged over €100 for cleaning I would expect the property to be clean on arrival. Window cills were filthy, the threshold to the dining room patio doors was full of dirt and grime which had obviously been there some time. The windows were filthy and the floors to the kitchen and bathroom were dirty too. The “Outside Kitchen” was old and dirty. The BBQ, fridge & paella dish were rusty and unhygienic. The sunshade over the hammock was tatty and worn. electrics were in what we considered a dangerous state. A taped up cable was found in the dining room, the swimming pool internal light was detached and was floating in the pool with exposed cables. In the corner of the garden was an old rusty scrap car and piles of goodness knows what we’re covered with tarpaulins around the property. The “games room” ie garage was non existent . The pool table was completely covered with tools, buckets and work materials and the “mini gym” and electronic darts were also piled high with building materials. 7 bags of wood pellets were piled in the lounge at the side of the pellet burner and the vacuum cleaner was left out in the dining room to clean the burner out ...not what we class as luxury! We contacted HomeAway who advised that as it was New Year we would struggle to find alternative accommodation especially with two small dogs. We reluctantly decided to stay at the property using it only as a sleeping base but we decided to leave a day early as we felt uncomfortable in the surroundings. We have stayed in many villas over the years and this is the worst we have stayed in to date. Do not be fooled by the photographs. This is my first con renter who wanted money in order to not publish a wrong and bad review. Would like to thank Marco for letting us have the use of his lovely villa for a week, myself and 11 friends had a great time here. Also thank you to Dave really nice guy and very helpful if we needed anything. Would definitely stay here again. We had a group of 9 guys who stayed for a week in this villa and we had a great time. Marco (Owner) was very efficient in answering emails regarding our stay. David (Caretaker) was excellent and ensured we had everything we needed. This villa is so cheap but is excellent quality. A hotel just does not compare if you are a big group. The beds were spot on and it had enough cooking and cutlery to cater for a small army! Easy taxi ride into Benidorm around 10 euro each way and a short walk to the supermarket. This is great for all types of groups. Thank you James it was nice to have you over. I booked this villa for my 50th birthday to share with a group of close friends, from the moment I booked Marco (the owner) was extremely helpful and responded to all my enquiries within 24 hours and even provided a detailed email with useful information about the villa and restaurants, events and things to do in the surrounding area. The villa was perfect, we met David (the caretaker) on arrival who showed us around and made sure the bedding arrangements had been set up as requested. The villa had more than enough chairs/tables and the kitchen was well stocked and had many games to keep everyone amused, everything was well labelled explaining how everthing worked and plenty of information leaflets to read with information of things to do. The top area of Costa Blanca Close to Benidorm, at 5 km distance from the big tourist area with all kind of types of services, restaurants, bars, super-beaches, promenades, shops, discoteques, hospitals, cinemas, etc. The villa is located in Albir, in the exclusive area of the Costa Blanca. Albir is lifely, always with a melting box of nationalities, with all kind of restaurantes and services. This Villa has a special atmosphere of joy, happiness and peaceful rest, and is ready for nice get-togethers with Family or Friends. Close to the Castle 'Conde de Alfaz' where Medieval tourist party dinner with horses and medieval knights & show which is especially interesting to take the kids to. There are 3 supermarkets at 800m distance: Mendoza (luxury and local food of european countries) , Mercadona (large, Spanish), and Lidl (cheap). Albir, a town on Spain’s Costa Blanca between Altea and Benidorm, is popular with families and couples looking for a Spanish beach holiday. Benidorm has some of the best sandy beaches in the region and plenty of facilities. Albir has a very special type of cobbles beach with part of it a sandy beach, to ensure that Albir remains secluded, not that busy as Benidorm, but still lifely also during the winter period. Regular flights to the Costa Blanca depart from most major airports. Albir has become a popular holiday destination also for sun lovers enjoying approximately 325 sunny days throughout the year, with a pleasant temperature during the year, giving a micro climate as regarded by the World Health Organization as one of the healthiest place in the world, ideal characteristics for living in Alicante and Costa Blanca region all year round. This attracts a well to do Northern European public frequenting this village. The numerous clear, sunny days make the area an excellent place for leisure and holidays, because it is possible to enjoy the fresh air every day of the year. There are plenty of attractions in this delightful coastal area, such as entertainment for the whole family as the theme and water parks and zoos like Terra Mitica, MundoMar, Aqualandia, Terra Natura and shopping centers, You can also hop on a coach into Benidorm, only 5 kilometers away from Albir, for its shops and nightlife. The beachside promenade in Albir is perfect for an evening stroll with a cooling breeze from the sea. Spa & wellness centers are only 5-10 minutes walk away. Albir centrum offers a wide range of services, supermarkets, banks, restaurants and cafes to suit all tastes. The picturesque Altea and its lovely old town is located just 7 km away. Alicante city center is at a short distance by car or tram. Excellent public transport links and easy access to the tram and the surrounding areas of Alicante. For golfers, the Alicante Golf is the best golf course in Spain and it has an 18-hole golf course, making it the perfect year-round destination for golf lovers. A driving range in Albir center and a public 2x18 holes at Benidorm 8km plus 1x9 holes in Altea-Vella. Popular place for Bikers: flat roads, and close to Port De Tudons 1020m and Coll De Rates 600m. The small island in front of Benidorm attracts many divers, there are Diving companies in Albir, Altea and Benidorm. Public volleybal courts at the beach in Albir.